Allan Flanders was one of the leading British industrial relations academics and his ideas exerted a major influence on government labor policy in the 1960s and 1970s. But as well as being an Oxford academic with a strong interest in theory and labor reform, he was also a lifelong political activist. Originally trained in German revolutionary ethical socialism in the early 1930s, he was the founder and joint editor of Socialist Commentary, the leading outlet for ‘revisionist’ social democratic thinking in Britain in the 1950s and 1960s. He was also the leading figure in the influential 1950s ‘think tank’ Socialist Union and played a key part in the bitter factional struggles inside the Labour Party. The main argument of the book is that Flanders’ ethical socialist ideas constituted both his strength and his weakness. Their rigor, clarity and sweep enabled him to exert a major influence over government attempts to negotiate labor reforms with the trade unions. Yet he proved unable to explain the failure of the reforms amidst rising levels of industrial conflict, as his intellectual rigor turned into ideological rigidity. The failure of negotiated reform led to Margaret Thatcher’s neo-liberal assault on trade union power in the 1980s. 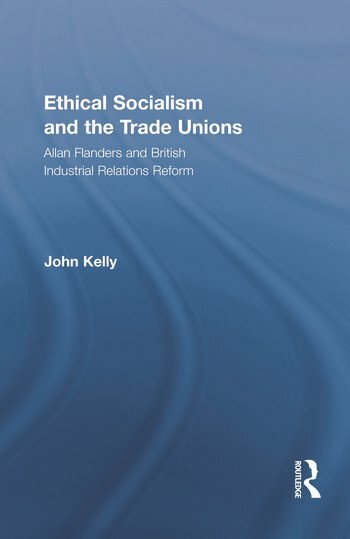 John Kelly is Professor of Industrial Relations in the School of Management, Birkbeck College, London University. His main areas of research are comparative labor relations, labor unions and industrial relations theory. Recent publications include Varieties of Unionism (co-editor, 2004), Union Organization and Activity (co-editor, 2004) and Rethinking Industrial Relations (1998).